The shopping centre in Shepherds Bush, London, is currently undergoing a £600m extension. Property Week joins director of development Duncan Bower on a tour of the construction site to find out what is in store. In the heart of Westfield London, there is a giant hoarding covering a store front. Normally in a shopping centre, hoardings are an ominous presence used to cover up a void. However, this particular hoarding has a discreet doorway cut into it that largely goes unnoticed by shoppers and when you walk through the doorway it takes you into what at the moment is a construction site thrumming with activity. In March next year, it will be packed full of retailers, including department store anchor tenant John Lewis. The £600m extension to Westfield London began in 2015 and when it opens it will bring 740,000 sq ft of additional retail, dining, entertainment and leisure space, in addition to a further 47,000 sq ft of office space. The 90-plus new units coupled with the 230,000 sq ft John Lewis brings the total number of stores at Westfield London to 450 across 2.6m sq ft of lettable area, making the centre the largest in Europe, according to Westfield. Property Week took a tour of the site with Westfield Europe’s director of development Duncan Bower to find out why the developer felt the urge to grow the centre’s footprint and to get an update on letting activity. Westfield London opened to a fanfare of publicity in 2008. Today it attracts around 28 million visitors a year and generates retail sales of around £1bn. At present, the area immediately surrounding the centre consists of a series of construction sites. Stanhope, Berkeley St James and Imperial College are all either on site or about to get under way with an ambitious series of developments spanning residential, leisure, offices and retail. Westfield starting eyeing up expansion opportunities before the existing centre even opened its doors for the first time. In 2007, it bought a piece of land from Stargas adjacent to the centre that mainly consisted of fairly low-grade industrial units and started working alongside the likes of the Greater London Authority, the local council, Transport for London and other landowners to work up potential ideas for the space. In retail, he argues, “rule number one is give the customer what they want and rule number two is give the customer more than what they want”. Hence the creation of the new John Lewis department store, which is being fitted out at the moment, plus a series of new units that connect back to the shopping centre’s main atrium. What the extension has also allowed existing retailers to do is rightsize their presence at the centre. As a result, H&M has moved from a smaller store in the existing centre to a new larger unit in the extension and Zara has upsized from 31,000 sq ft to 40,600 sq ft.
That is not the case for all retailers, however. Boots, for instance, has decided to downsize its presence in the extension. 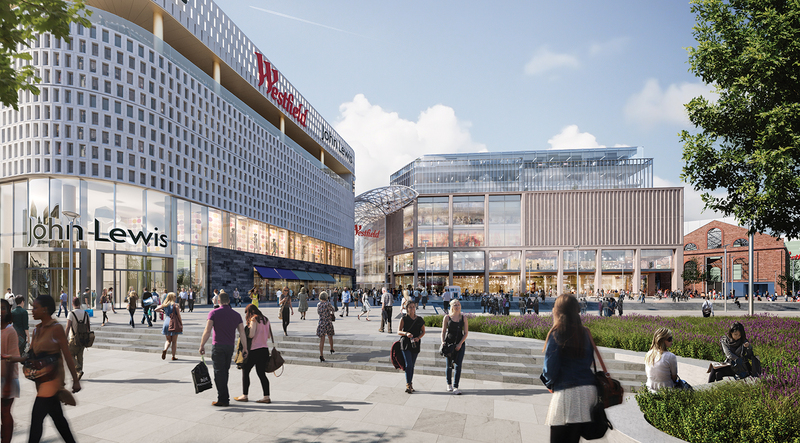 At present, 85%-90% of the units in the extension are let, but the developer’s investment isn’t solely focused on bringing new retailers to the site or relocating existing retailers; Westfield is also splashing out to spruce up the original building. That asset management includes enhancing the mixed-use nature of the centre. At present, Westfield London boasts around 100,000 sq ft of office space, with an additional 47,000 sq ft in the new extension. Residential also has a valuable role to play, says Bower. “Westfield is not really known as a residential company but we’ve got permission for about 1,500 units here and about 3,500 units across London,” he says. This links into the new public realm space at a dedicated outdoor events space, which will accommodate a series of new bar and restaurant occupiers and play host to a number of different events. Further down the line, Westfield also has plans to bring a listed building, which was formerly a bus garage, back to life. The 16,000 sq ft Dimco building, which has the volume of three storeys, is being used for construction logistics at the moment, but when the extension is completed the developer intends to put a new roof on top and turn it into what Bower describes as a “weather-controlled” venue. “In addition to the shops, eating and leisure, we are becoming more of an entertainment destination and we will be able to host events in that building which would not be possible in the [centre’s main] atrium,” says Bower. The countdown to the grand opening has already begun and Westfield is confident that the new extension will be delivered on time. The scale of the developer’s ambition for the centre is great and its vision for the site is impressive, but the true test will come when the new improved and significantly enlarged Westfield London throws opens its doors to the shopping public for the first time in March next year.